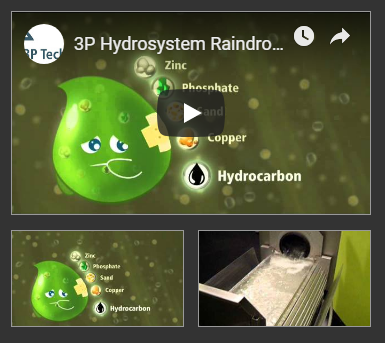 3P Technik UK‘s wide range of rainwater harvesting, mains top-up, level control and pump controllers are under constant development by our innovative engineers. 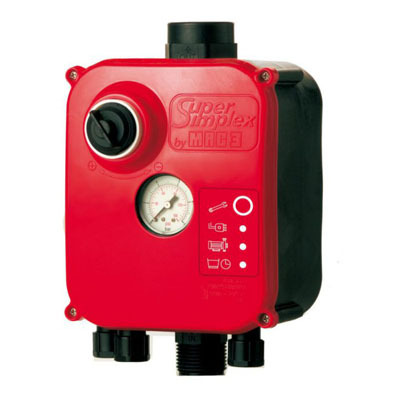 The controllers can operate any type of pump or fluid. There are complex multi-pump and/or multi-tank Controllers, through to basic timer Controllers. They are ideal deployed with above ground tanks, or where one tank needs to feed another tank, or to balance tank levels. if you need more information, help selecting the best pump control panel for your needs or simply want to buy our products, please Contact Us or call us on 01239 623506. 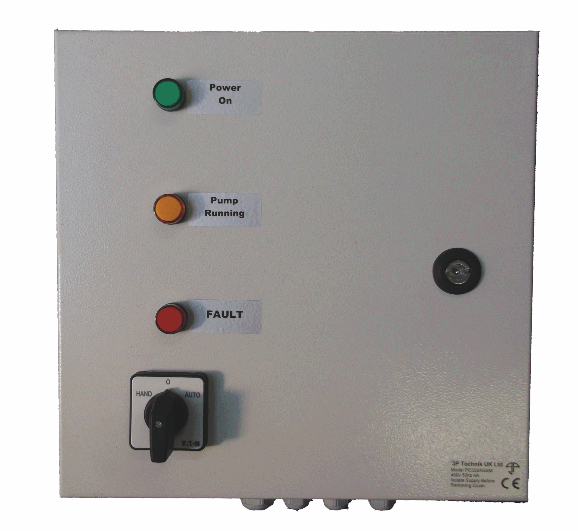 Quadri CosPhi Pump Control/Protection Panel of a single submersible pump. Built in Dry Run Protection using CosPhi monitoring of the motor itself . Options for Single Phase or Three Phase. This Controller can function in either an automatic or manual configuration. 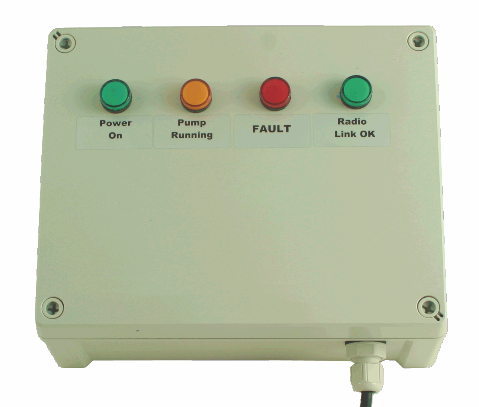 The Quadri is a direct on-line starter and pump controller for use with Single and three phase systems. It is able to control up to two pumps and balance the load between them for Boosting, Storage or Sewage pump systems. Functions in either an automatic or manual configuration. 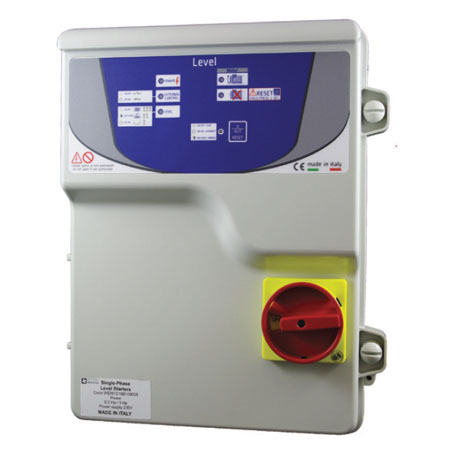 A 3 Phase 400v Direct On-Line pump controller with on-demand activation from 2 inputs (float switch or pressure switch),manual override and long range remote operation options for commercial and industrial environments. Note – Many 400v controllers actually need a 230v supply as well (3P+N+PE), this controller only requires 400v (3P+PE) and can be retro-fitted where no neutral phase may be readily available. 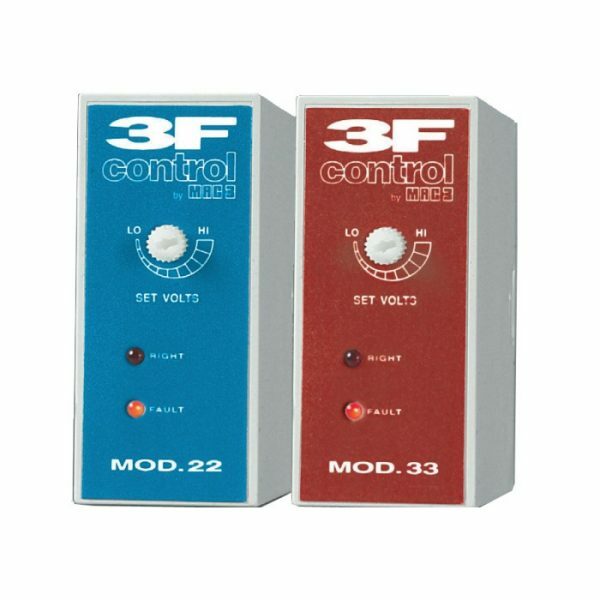 The Mac3 3F Controls are a DIN socket mounted single phase, adjustable under-voltage monitoring and protection relays intended for use in control panels. Mod.33 is three phase with additional phase loss protection. For use in Clean Water or Liquid Food Products. 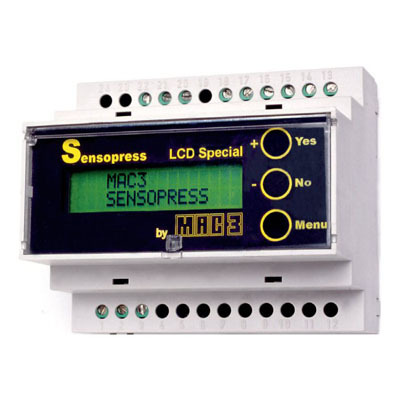 Mac3 Sensopress is a programmable, DIN rail mounted level controller and is ideal for integration with OEM and panel built products. Sensopress can function with any liquid using a probe and can be manually calibrated to accept probes of different ranges. Sensopress is available in single channel and multi-channel models. The single channel model is supplied with a single output for controlling one external appliance, whereas the multi-channel is supplied with 4 outputs. Each output channel operates independently and may overlap in range. 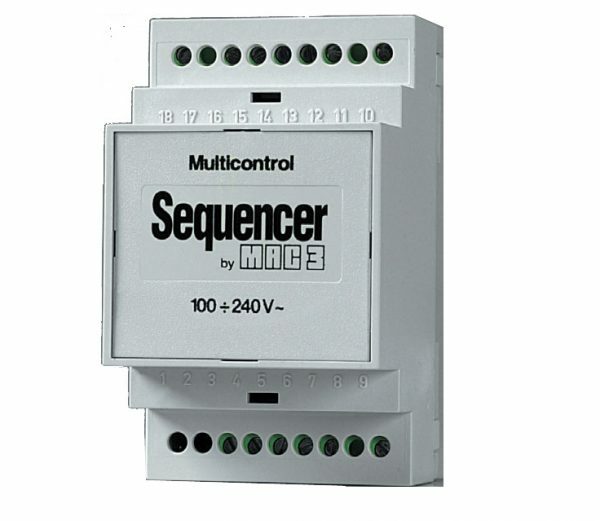 Mac3 Sequencer is a DIN rail mounted device which balances the run-time of 2 or 3 pumps in a duty standby/assist configuration depending on model. Pumps are alternated during normal usage, but allows the controller to activate both pumps together if there is a sudden demand. 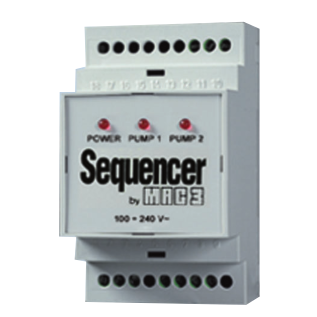 Sequencer 3 – Advanced version of the sequencer that drives groups up to 3 pumps. Interface with LED’s and control buttons. 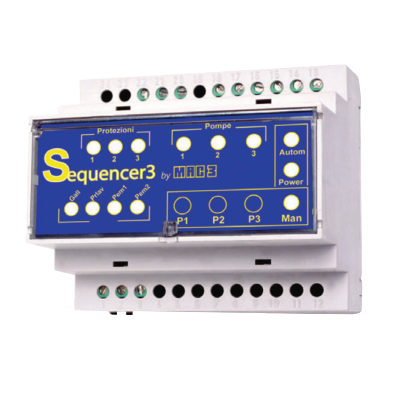 Sequencer 2q – It has the same characteristics and functions as the sequencer with the addition of a panel containing two switches for pump operation and seven LED diodes that always show the system status. Mac3 Sequencer is a DIN rail mounted device which balances the run-time of 2 or 3 pumps in a duty standby/assist configuration depending on model. Pumps are alternated during normal usage, but allows the controller to activate both pumps together if there is a sudden demand. Sequencer 2 – Is has the same characteristics and functionality as the sequencer with the added LED’s for visualising faults. Mac3 Sequencer is a DIN rail mounted device which balances the run-time of 2 or 3 pumps in a duty standby/assist configuration depending on model. Pumps are alternated during normal usage, but allows the controller to activate both pumps together if there is a sudden demand. 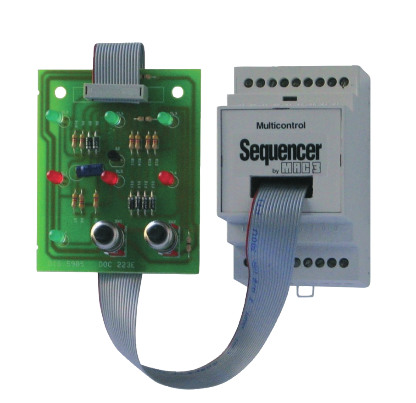 Sequencer – In rail mounted device which balances the run-time or 2 pumps in a duty-standby/assist configuration. 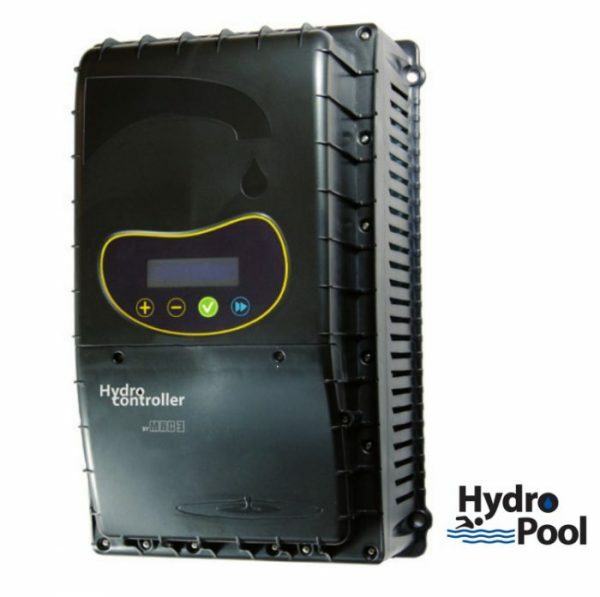 The HydroController Pool enables significant energy savings for swimming pool pumps by running the pump at reduced speeds when desired. 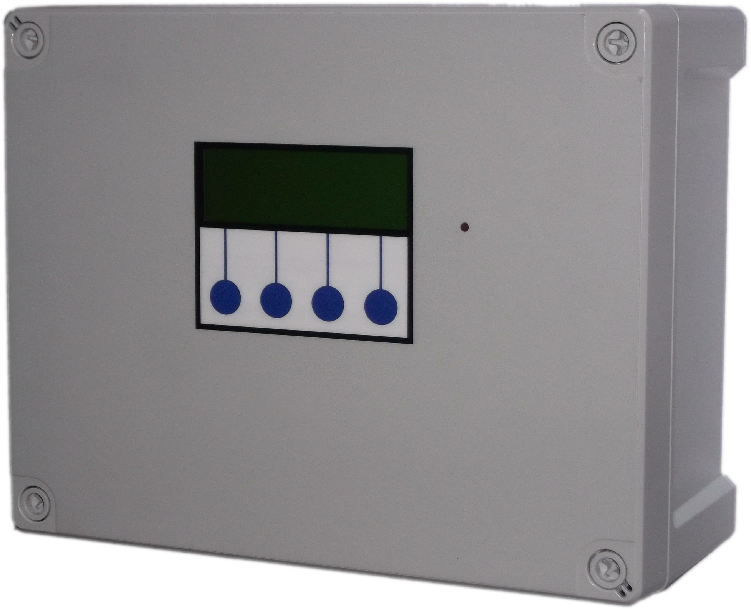 Operating parameters are customisable through the onboard interface with LCD display. Up to 4 pre-programmed speeds can be used. The advanced versions of the Controller include a WiFi feature which allows the user to configure the system from any internet location. A web-based application enables configuration of a weekly operating schedule. 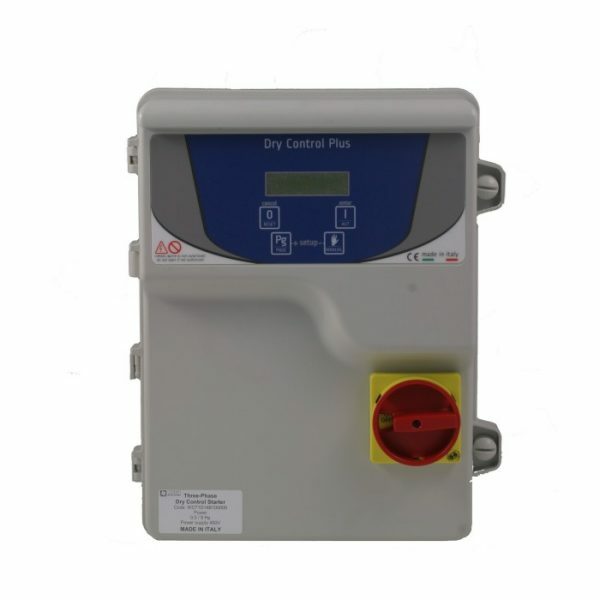 A range of inverters/variable frequency drives (VFD) for use with off-grid solar power systems. 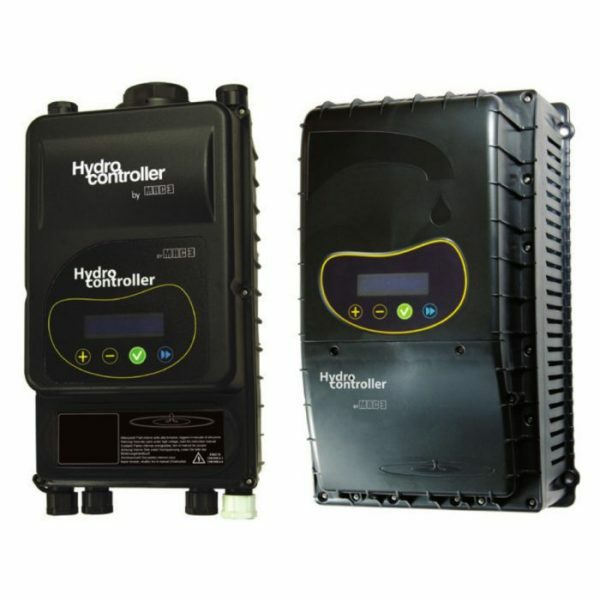 The HydroController Solar adjusts the speed of the pump to match demand, and the speed is varied (if necessary) to match the available power from the solar panels. No battery storage is required. 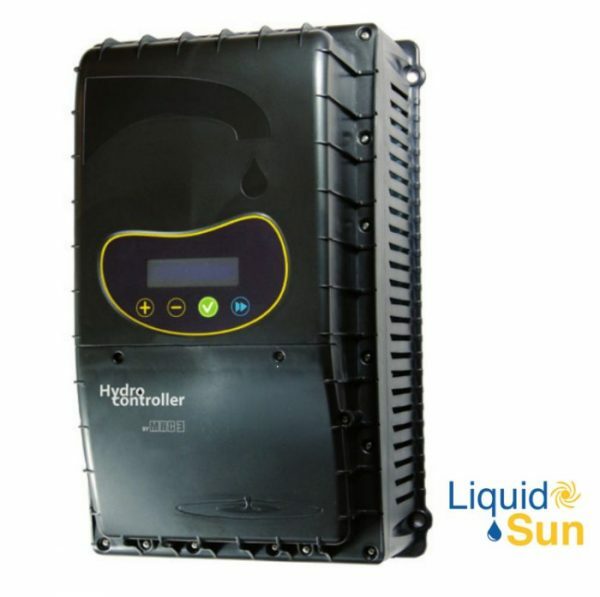 The HydroController Solar continuously uses all the available solar energy until the required system pressure is reached. 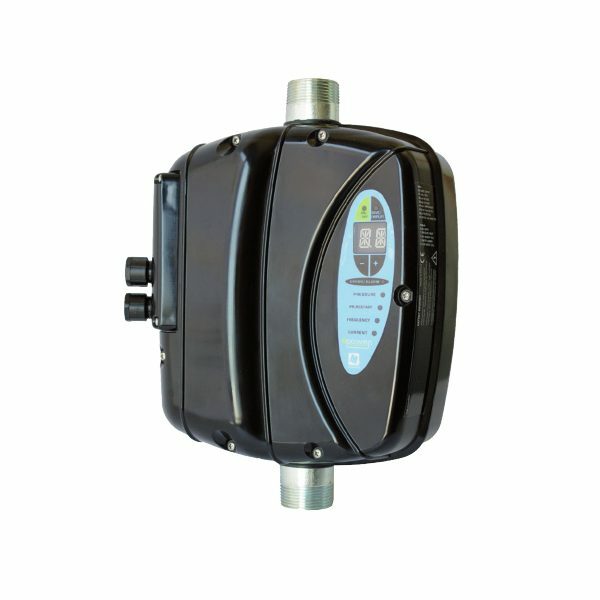 Designed for residential systems, the E-Power is ideal for Booster Pump Sets. Available in two variations, E-Power Std, and E-Power Adv. E-Power is constructed around a stainless steel pipe and pressure sensor without non-return valve or any other flow obstruction resulting in increased system efficiency and superior reliability due to excellent self-cooling characteristics. 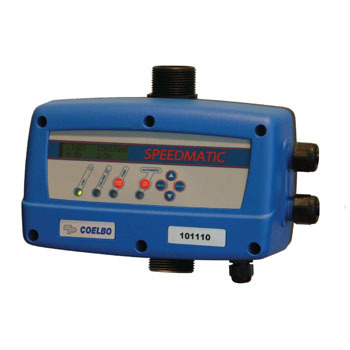 Variable speed pressure control for single or three phase pumps. In pump mounted, the E-Power is constructed around a stainless steel pipe and pressure sensor without non-return valve or any other flow obstruction resulting in increased system efficiency and superior reliability due to excellent self-cooling characteristics. Pressure switch for single and three phase pump contol in boosting systems with a pressure vessel. 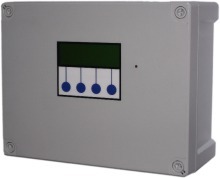 Single phase pump controller which is installed on clean-water pipe work. By using a single speed, variable pressure control system, the PresSystem ensures pump efficiency by reducing the time a pump is run to maintain pressure in the system. Dry Run Protection via either a Float Switch (not included) or built in CosPhi option. For home (domestic) header tank boosting or in-line boosting of low mains water pressure. Pump control for pressure boosting by pressure and flow detection. 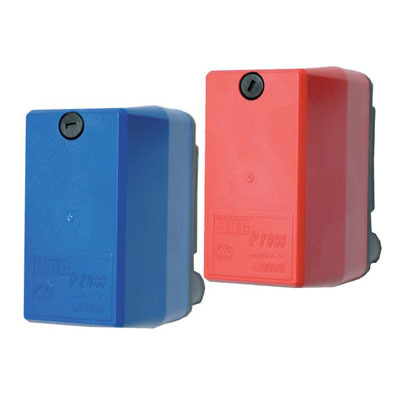 The pump starts by pressure/flow sensing and the pump is stopped by flow sensing. 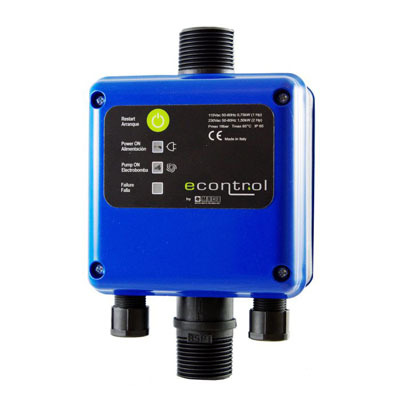 When either water flow or a pressure drop is detected, the E-Control engages the pump to maintain pressure in the system until it detects that the flow has stopped when it disengages the pump. Clean water only. For home (domestic) header tank boosting or in-line boosting of low mains water pressure. Pump control for pressure boosting by flow detection. When a flow is detected in the pipe, E-Flow runs the pump to increase pressure in the system until it detects that the flow has stopped. 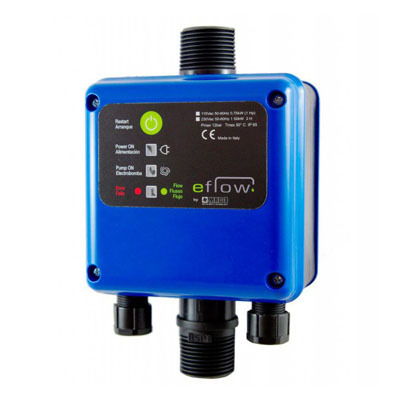 E-Flow can control a single phase pump of up to 2 Hp (1.5kW). Clean water only. Pump pressure with built in dry run protection. A warning light on the control panel indicates if there is a fault. 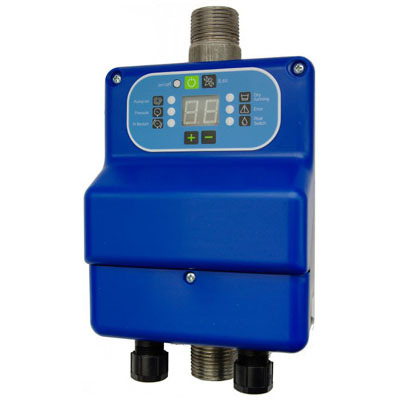 Controls single phase clean water pumps up to 2Hp (1.5kW). This model uses pressure and flow sensing to decide when to run the pump. 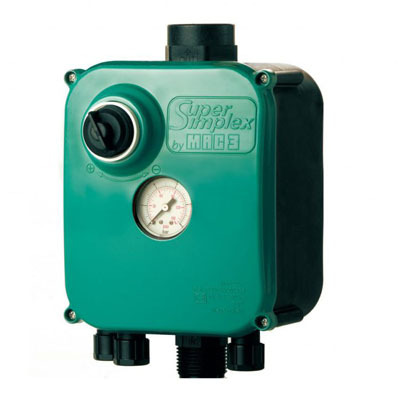 Pump pressure switch for use with a float switch for dry run protection. 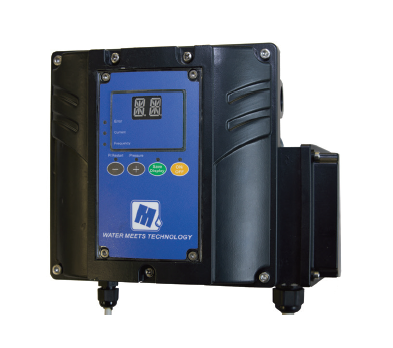 Controls single phase clean water pumps up to 2Hp (1.5kW). INV Series Highly versatile variable frequency drives designed to control and protect commercial plumbing systems by varying or changing pump speed. 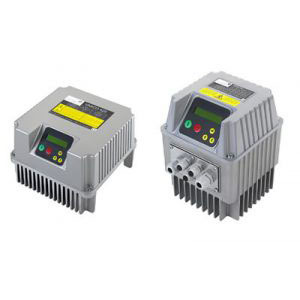 XINV Series Adjusts pump motor speed to maintain constant pressure. The desired pressure can then be adjusted from the keypad. PF Series – Pressure based pump control (variable pressure). Multiple booster pump controller. Pressure control of multiple pumps from a single Control Panel and pressure sensor. Fixed speed variable pressure pump control with adjustable start and stop pressures per pump, and intuitive menu driven options.